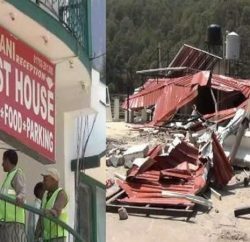 The Himachal Pradesh public works department (PWD) employee, who was injured in the Kasauli firing incident on May 1 that killed a government officer during a demolition drive of illegal constructions, died on Saturday night. Gulab Singh (46) of Kanda village in Kasauli was put on a ventilator on May 10 after he suffered a cardiac arrest at Chandigarh’s PGIMER. Gulab Singh was admitted to the PGIMER after he was hit by a bullet few inches below his heart when hotel owner Vijay Singh allegedly fired following a heated argument during the demolition drive. The Himachal Pradesh Chief Minister announced to provide financial assistance of rupees five lakhs to the family of Gulab Singh. Chief Minister Jai Ram Thakur said the family members of the deceased employee would also be provided full salary for his remaining service period. Gulab Singh was a part of a team along with Shail Bala Sharma, who was died on the spot, obeying the orders of Hon’ble Supreme Court for demolition of unauthorized construction by hoteliers at Kasauli in Solan district.